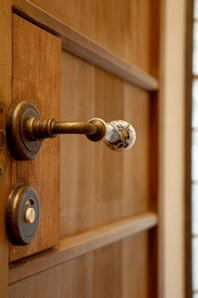 Most facilities of Otabi-an Hostel are shared-use facilities for all hostel guests and staff. No smoking in and around this hostel for comfort and safety. Please note that smoking on the street is prohibited and there is no smoking area near the facility. We will accept guest's luggage(s) before check-in to store in the morning time from 8:00 to 10:30, only if requested by email or phone in advance. Our staff may not be available unless requested. Please refer to Baggage Storage Service at Kyoto Station. We ask the guests to leave the room between 10:00 and 16:00 for housekeeping. Otabi-an Hostel is located in a Kyoto residential area. Please return to Otabi-an from your daily outing by 23:00 in consideration to our neighbors. Lights in the living room will be turned off by 23:30. Within the neighborhood and inside the Otabi-An hostel, please be considerate at all times and refrain from causing any nuisance to other guests and neighbors such as speaking in a loud voice, midnight phone call, heavy drinking and partying. We might eject a guest from our hostel for his/her mischievous behavior to other guests or the neighbors. The prepaid room charge will not be refunded in that case. For your safety and those of the other hostel guests, no outside unregistered guests are allowed to be invited into the hostel. Kyoto “machiya” townhouses traditionally are built with earthen ground floors, known as “doma” in Japanese. At entrance hall of our hostel, and Otabi-an's living room, original “doma” with a hundred-year-old wooden table top, made of Muntingia calabura has been preserved for authenticity. Please feel free to spend relaxing time and enjoy conversations with other hostel guests while using the lounge. This room can be used as a dining room. A refrigerator, a toaster oven and a microwave are available in the living room for self-service use. 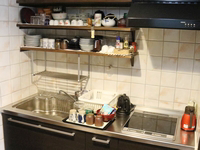 IH cooker, kitchenware and tableware shared with the hostel staff are available. Before using the kitchen, please contact hostel staff for assistance. Please clean kitchenware and tableware by yourself after each use. A shared bath/shower is located on the second floor of Otabi-An Hostel and available from 16:00 until 23:30 in the night and from 7:00AM until 9:45 in the next morning . Please give consideration to other guests who may be waiting to use the same shower after you. at the wash stand on the second floor. Please finish a use of the hair dryer by 23:30, as its loud noise may disturb sleep of other guests. A “Sento”, Nippongo for a public bath, known as the “Hinode-yu” , is also available near the Otabi-An Hostel. Hinode-yu is a public bath located in Nishi-Kujo area, near the Otabi-an Hostel. It is famous for its quaint appearance, maintaining its original structure, built in 1928. Hinode-yu is also famous as set location of the Japanese film “Mother Water” released in 2010, staring Satomi Kobayashi and Kyoko Koizumi. A shared rest room and wash stand are available on both levels of Otabi-An Hostel. Each rest room is equipped with the TOTO Washlet with automatic flashing and a motion sensor light /extractor fan, although the door to the rest room is an original fitting of the ‘machiya”. The wash stand on the first floor is a replica of an original design of a Japanese tiled sink, popular in early Showa era of Japan. An earth ware washbowl on the second floor is a piece of original fine art work by MORI SHUNZAN, pottery of Kiyomizu Ware, specially handcrafted for Otabi-an Hostel, adorned with Toji Temple's five story pagoda, spring cherry blossoms and highlighted by leaves with autumn colors. The pottery of Kiyomizu is located near Sennyu-ji Temple, noted for its connection with the Japanese Imperial Family. charged for each use :200 yen. Start time of use of the washing machine :until 22:30 / from 7:00 in the morning. A brief minute walk from Otabi-An Hostel, located in front of the Omiya-Hachijo bus stop. This is a meat shop, but freshly-fried croquette and Japanese deep-fried foods at the front of shop (Last orders at 19:00) are very popular with the locals and you may often see a queue forming during the busy hours. Just one-minute walk from Otabi-An Hostel. “Shouyu-tonkotsu ramen”, ramen braised with pork bone broth and soy sauce, is a specialty of this shop. This ramen shop is open until midnight, but we request your return to Otabi-An Hostel no later than 2330. Thank you. About a four-minute walk from Otabi-An Hostel. Japanese “teishoku”, or set meal, also known as combo meal, is what this restaurant offers. It is located at the corner of Hachijo-Abranokoji crossing, near Kyoto station. Open from 7:00 to 23:00. Lively Japanese style drinking and Okonomi-yaki spot, offering foods grilled on the hot iron plate, where local people often gather and talk. Open at 18:00. About a six-minute walk from Otabi-An Hostel,close to the Kyoto Aquarium in Umekoji park and the 2nd floor of "Mini-Stop" convenience store. A buffet style restaurant offering freshly picked organic vegetables (Kyo-Sayai) delivered from local farms in the every morning. Morning time from 7:00 to 10:00. Lunch time from 11:00 to 16:00. Evening time from 17:00 to 22:00 (last order 21:00). Roughly six minutes by foot from Otabi-An Hostel. A mall near Kintetsu rail Kyoto station offers stores bountiful of souvenirs, and restaurants with local delicacies for dining. Others stores that can be found here are book shops, travel agencies, and convenient stores for various sundries and shopping. A large-scale, western style shopping mall with a food court on the fourth floor and multi-cinema complex is also close to our hostel at about a six-minute walk. The AEON Mall also houses one of the largest Daiso store (Hundred Yen Store) of the Kansai region. *Information for shops shown here is subject to change. copyright©2016 Kyoto Guest House OTABI-AN all rights reserved.